ARS scientists have found a way to map the structure of an elusive protein that gives certain plant viruses the ability to travel from plants to insects, through the insects, and back into plants. Agricultural Research Service scientists in New York and California have developed very different technologies that share a common thread. They offer scientists new, innovative ways to probe what happens when a crop is threatened by drought or disease. 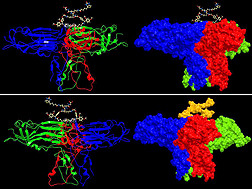 Michelle Cilia and Stewart Gray, ARS scientists at the Robert W. Holley Center for Agriculture and Health in Ithaca, New York, and their colleagues at the University of Washington have found a way to map the structure of an elusive protein that gives certain plant viruses the ability to travel from plants to insects, through the insects, and back into plants. Andrew McElrone, a plant physiologist in the Crops Pathology and Genetics Research Unit in Davis, California, has adapted computed tomography (CT) scan technology to vastly improve on the tools available for studying how water and pathogens move through vascular plant tissue called “xylem.” The work has opened a window into how grapevines respond to drought stress and is shedding light on vascular networks in a number of other crops. 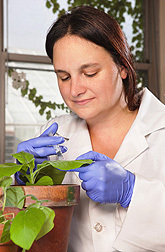 Michelle Cilia, a molecular biologist in the Biological Integrated Pest Management Research Unit in Ithaca, New York, examines infected potato plants in the greenhouse for symptoms of virus infection. Each luteovirus species is very particular and can only be transmitted by a few species of aphids. Cilia, Gray, and their partners James Bruce and Juan Chavez of the University of Washington think that the outside shape, or topology, of the virion plays a major role in that specificity, determining whether a virus will be able to move through the aphid and infect a plant. Cross-linking measurements with protein interaction reporter technology enabled ARS scientists and their University of Washington colleagues to model the structure of the building blocks of infectious potato leafroll virus particles. 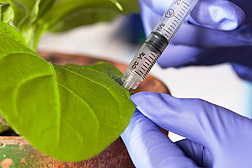 The scientists are applying this technology so they can understand insect transmission of plant viruses and the mechanisms viruses use to infect plants. “As a virion, the virus moves from plants to aphids, through aphids, and back into plants, and the topology of the virion guides the transmission process,” Gray says. A minor structural protein of these viruses is instrumental in guiding the virion on its journey through the insect. “These proteins extend from the shell of the virion and act like extension cords, giving the virion the flexibility it needs to make necessary connections in the plant and aphid,” Bruce says. Flexibility is critical to how these proteins function, but it also makes them extremely difficult to study. Until now, there has been no structural information for these proteins. Such information is crucial for developing new ways to disrupt virus transmission. 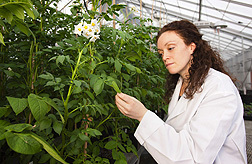 In tests with potato leafroll virus, the researchers used protein interaction reporter (PIR) technology, a tool developed in Bruce’s lab, tostudy protein interactions. The lab developed a unique set of chemical compounds, or PIR cross-linkers, that would interact with the structural proteins that guide the virion on its journey. These PIR cross-linkers enabled the team to capture a molecular snapshot of the structural proteins as they exist in the virion. Coupled to high-resolution mass spectrometry, the advanced molecular design of the PIR cross-linkers enabled the scientists to visualize for the first time the critical topological features of the virion. The results were published in the Journal of Proteome Research. “We are able to map topological features of the virus that no one has ever seen before,” Cilia says. The next step will be to use PIR technology to discover how the virion and the structural proteins interact with plant and insect proteins. 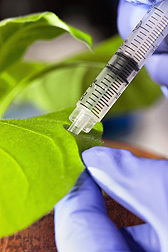 Injecting a liquid culture of a plant-infecting bacteria to deliver an infectious clone of the virus into plant cells. In Davis, McElrone has found a way to use high-resolution CT to study the vascular systems of grapevines and other plants in greater detail than ever before. For his studies, McElrone used the microtomography beamline at the Advanced Light Source, a unique and powerful tool at the U.S. Department of Energy’s Lawrence Berkeley Laboratory. He and his colleagues focused on the xylem tissue, which consists of tubelike elements that carry water and nutrients throughout the plant. Drought conditions increase tension on the water column in the xylem tubes, making them more susceptible to the formation of air bubbles, called “embolisms,” that interrupt the water flow and lead to damage or even death of the vine. With the instrument, McElrone created hundreds of images of the xylem tubes, showing the embolism-formation process in grapevines exposed to drought stress. The team developed software that extracts information from the images, allowing them to visualize how every vessel in a cross section of xylem tissue is connected to every other vessel, as well as the sizes and orientations of the connections. Much of the work was funded with a National Science Foundation grant, and the software is available free to other researchers. Some pathogens target the xylem tissue. Using the CT technology, McElrone found that a key to infection susceptibility is the presence of specialized “bridge cells,” which interconnect larger xylem tubes. His research has shown that how well the bridge cells link the xylem tubes could contribute to how well the bacterial pathogen that causes Pierce’s disease, which results in major damage in vineyards, will move through the grapevine. Grapevines susceptible to Pierce’s disease have more bridge cells, which may allow pathogens to pass through them more easily. The CT scanning technique is a vast improvement over the traditional method of studying individual cross sections of grapevine tissues under microscopes. Being able to study embolism formation and the connections between xylem tissues in such fine detail will help scientists determine how plants respond to water stress and other changing environmental conditions. It also should assist in efforts to breed crops better equipped to tolerate drought and resist disease, McElrone says. McElrone has a manuscript accepted in the Journal of Visualized Experiments and an accompanying film that demonstrates the technique for other scientists. Much of his work has focused on grapevines, but he is working with other researchers to use the technology to study vascular tissues in other crops, including blueberries, citrus, sunflowers, and walnuts. “This is a new technology and we are just beginning to appreciate the possibilities,” McElrone says.—By Dennis O'Brien, Agricultural Research Service Information Staff. The research is part of Plant Diseases (#303) and Crop Production (#305), two ARS national programs described at www.nps.ars.usda.gov. To reach the scientists mentioned in this article, contact Dennis O’Brien, USDA-ARS Information Staff, 5601 Sunnyside Ave., Beltsville MD 20705-5128; (301) 504-1624. "New Technologies for Studying Crops and Crop Diseases" was published in the April 2013 issue of Agricultural Research magazine.